The Master of Arts in Teaching: Secondary Education Program allows the candidate to obtain both the Single Subject Credential and the master’s degree through an integrated program of coursework, fieldwork, and student research (40 units). The Donna Ford Attallah College of Educational Studies has developed a specific Master of Arts in Teaching: Secondary Education - Music Education Program Emphasis for those who wish to teach music education at the elementary, middle school or high school level. The program has three substitutions for current degree requirements. 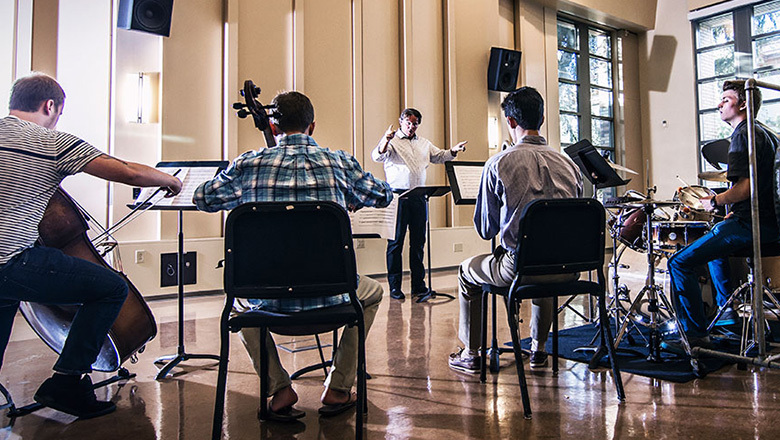 Students pursuing the MAT: Music Education Program Emphasis will incorporate the following substitution within their program of study, which will be taught by Music Education faculty. Because the MAT: Secondary Education Program is an integrated program, students may not subsequently enroll in the MAT: Secondary Education program if they begin as a “credential-only” student. Additionally, students who already possess a Single Subject, Multiple Subject, or Special Education teaching credential from California or any other U.S. state are not eligible for admission to the MAT: Secondary Education Program.